29 August 2018 – Flying Cows of Jozi will host a Spring Walk in the streets of Johannesburg CBD on Saturday 29 September 2018 in collaboration with Gauteng Opera. With the walk we’ll celebrate Joburg’s Heritage of youthful Activism and raise funds in support of the students of the Gauteng Opera Academy. The walk will begin at 10h00 at the Market Shed @1Fox with coffee and a welcome talk. From there we’ll venture into town to experience the diverse sights, sounds and special encounters that spell Jozi. We’ll visit the historic core of the Johannesburg city centre, where you’re reminded of the activists of South Africa’s turbulent past. This is where Mahatma Gandhi, in the early 1900s, and Nelson Mandela, in the 1950s, left their activist footprints. Both heroes are honoured here with statues, as are Albertina and Walter Sisulu and Oliver Tambo. A tribute to activism and democracy can be found on Beyers Naude Square with the slogan ‘Democracy is dialogue’. An excellent location since the Square, neighbouring Luthuli House and various provincial government buildings are still popular destinations for demonstrations of all sizes and during weekdays the sound of rhythmic toyi-toying often reverberates through the streets. We will visit these public art works and along the way we’ll encounter a vibrant variety of street vendors, little shops trading shoes and spices and entrepreneurs bringing new ventures to town. Some of the shops have been around for almost 100 years, their survival through all inner city developments making them activists in their own right. 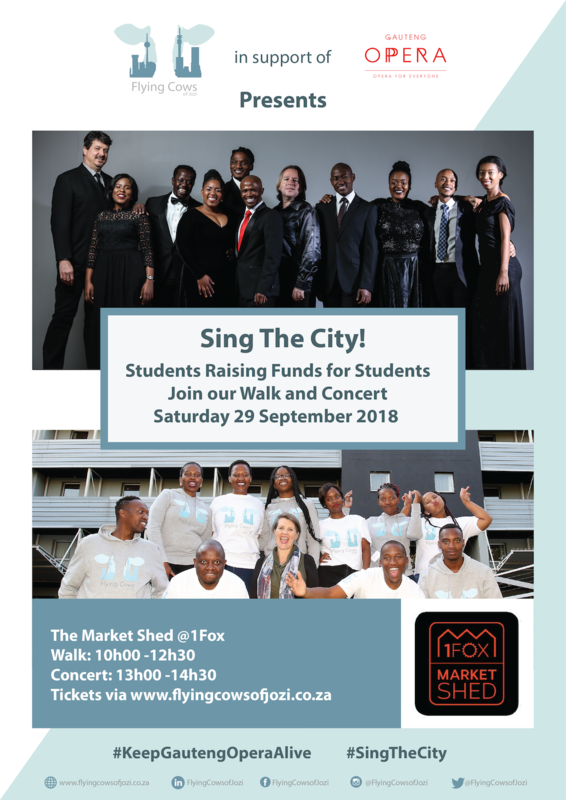 Around 12h30 we’ll end the walk back at 1Fox where Gauteng Opera will treat walkers and other visitors to a joyful concert and we can enjoy a leisurely lunch which can be bought from the wide selection of vendors at the Market Shed. The walk will be guided by Flying Cows of Jozi founder and inner city resident Josine Overdevest accompanied by Flying Cows of Jozi employees: University of Johannesburg students at the Faculty of Education who work with the company on digital education projects. Both Flying Cows of Jozi and Gauteng Opera are based in Marshalltown, which we’ll visit on the walk and both organisations provide young people with education and personal development . With the walk the Flying Cows of Jozi students will raise funds to support the Gauteng Opera students to continue their studies with the Gauteng Opera Academy. Tickets for the Walk are sold for a minimum prize of R250 and since all proceeds will be donated to Gauteng Opera, walkers are of course welcome to contribute more. For bookings please contact Josine at josine@flyingcowsofjozi.co.za or 083 729 8435.